coat // mixes of brown. - he does not have a high level of strength and is rather gaunt. - does not trust easily. - bizarre way of speaking. overall appearance // Arcaviouse is a rather gaunt fellow, standing at 45 inches or 3 and-a-half feet. He weighs only 130 pounds, and rarely puts what muscle he has to use. He has a broad shouldered structure, and well splayed muscle. The way in which his muscle is spread out upon his body gives him less of a grim appearance, being so thin and yet so tall. His appearance can come off as a bit ugly just because of his stature. He is rather clumsy and can be quite ungraceful at times though he can make up for that with his quick thinking and wits. His appearance may not be of the average Alpha appearance, but he still plays the part well. 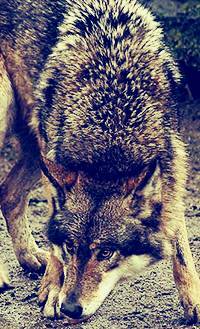 His fur, however, seems to carry a pattern of black that folds out from under the light-brown ruffles of his fur. As he looked further and further down his body, the colors become lighter and lighter. His eyes are a lovely ginger color. persona // Arcaviouse is not a simple fellow. His labyrinth of a mind is hard to navigate. You can rarely tell what he is feeling, what he is hiding deeply below the surface of his exterior. He trusts others to understand what he is going through, when he needs help, and if they can help him or not. His overt behavior is rather cryptic in this way, giving him the nicknames “Arcane” and “Labyrinth.” He may be friendly and outgoing at times and sulky in the next. Arcaviouse is not someone you will easily befriend and gain the trust of; you have to work to get his attention, to get his fleeting glance, to make his presence pleasurable. He holds a solemn vow to whoever is deemed dominant over him. He holds close a code of honor to his dominant. Some would never even think, for a split second, the thing he vows to do if he ever breaks the moral code that he has written inside of him. He’d vouch for the evilest dominant, as long as he could trust them. He will never question the most malicious of doings if they are justified by a true sense of dominance over Arcaviouse himself. His sense of right and wrong may be backwards, upside down, and be his undoing but you will always unearth some good in the beauty he can see inside of everyone. He’d kill for his commander, he’d murder entire kingdoms to protect whoever it is that he trusts, that he loves. Arcaviouse would place himself in the way of immediate danger if it had even the slightest chance to help others. His lack of self has proved useful for others but also rather suicidal for Arcaviouse. He will follow the most harebrained schemes as long as they are of a sound character that he knows he can vouch for. Nothing is evil in this man’s mind; nothing is wrong, nothing can ever not be turned to right, nothing can be evil or ill-intentioned. It can seem, at times, that Arcaviouse lives in a land filled with lollipops and candy-canes, unicorns, and rainbows because of the way he can optimize every bad thing you may throw at him. In all truths, he believes everybody is the same, only in a disguise or that they have somehow changed their appearance. He has locked onto one significant other, which is the dominant of his past that he had grown to love and care for. She brought him a true feeling of safety and now had become fixated upon her. The day she died, however, was not devastating for Arcaviouse for he thought she was still alive because of his delusion. He often won’t bring it up but he may say something that can set you off on a rampage of suspicion. Some may try to reason with him, after learning of what he is seeing, what he is thinking, and what mad delusions he possesses. But there is no bringing back Arcaviouse from this; you will only ruin what bond you may have formed with him by doing so. Or, in a turn of events, he won’t even hear what you are actually saying. He will most likely hear conversations of his past and act accordingly. past // Arcaviouse grew up in a well home, his parents Alphas of their own pack. He had one brother and one sister, although one was still-born and the other died the first winter. His mother was Elisha, a sweet and caring female who loved pups and always wanted some of her own. The deaths of her children were devastating but she was overjoyed when Arcaviouse passed through the harsh winters, unlike his brother and sister. Elisha was always very caring, taking the best of care she possibly could to her last living child. Arcaviouse's father, however, was always busy with tending to the pack's needs, and many other thing. Arovia, his father, tried his best to get back soon enough to help with the caring for his son. He always would apologize to Elisha for not being back before Arcaviouse fell asleep for the night, or when he wasn't occupied by something else. Aroavia tried to be a good father but he was too busy providing for his son to actually become a memory. Now aged a year, Arcaviouse was brought the news about Aroavia disappearing. Arcaviouse had been accompanying a hunting trip so he could tone his skills and upon his arrival back at the den site, the Royal Messenger, Weila, told him his father had gone missing a few days after he left. Arcaviouse was shocked by the news but did not grieve; he had no reason to be sad because his father was missing. He never was there for him when he needed him the most, so why pay him the respect of grieving for him. He barely knew who this man, Aroavia, was supposed to be to him. Whenever they did see each other, Arcaviouse didn't care to pay the due of calling him "father" and spoke his first name, Aroavia. Deep in his mind this man who helped create him still lingers, but he only lingers with the cryptic questions of, "Where are you?" and "Who are you?" human or wolf // wolf. "Yawn-a-rooney. We both know you eat punks like that for breakfast. I've got some real surprises in store for you." Accepted, you may now role-play with Arcaviouse!